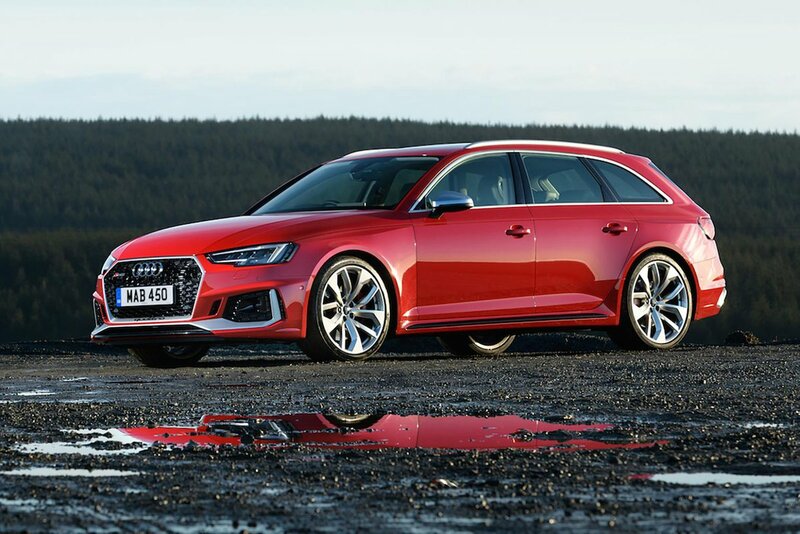 Audi RS4 Avant Performance, Engine, Ride, Handling | What Car? A standout option on the Audi configurator is Dynamic Ride Control, a clever suspension system that uses three-mode dampers that are diagonally linked with hydraulic fluid. It’s a similar system to that used on high-end McLarens and promises to provide outstanding low-speed compliance while offering excellent body control in corners. And on that first claim, it certainly delivers. Where rivals such as the BMW M3 and Mercedes-AMG C63 thump and bump their way around urban routes, the RS4 smooths over the worst of battered bitumen. In fact, not since the McLaren 720S has a performance car made us stand back and marvel at the otherworldly abilities of hydraulically controlled suspension. However, the magic of the McLaren system is that it can offer firmer responses when the road becomes more challenging, and that’s where the RS4 begins to struggle. Through quick direction changes, the RS4 pitches and rolls on its springs, robbing you of confidence on the way in to and out of corners. Ramping up from Comfort to Dynamic driving mode brings increasing authority to body control, but the car never feels as tied down as the conventionally suspended M3, C63 or Alfa Romeo Giulia Quadrifoglio – the latter managing to mix superb ride quality with razor-sharp handling. Therefore we think it’s worth sticking with the standard passive dampers. 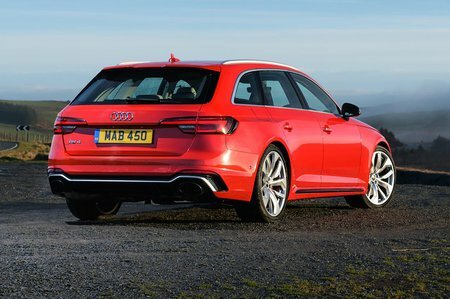 They allow a more natural body lean and there is far less float over severe crests, giving you the confidence to push on when driving on demanding country roads. The downside is that the stiffness required for this level of control can translate to a pronounced fidget around town, but we think this is a worthwhile compromise for more predictable and confidence-inspiring dynamics. Another option that Audi likes to promote is Dynamic Steering, which varies the weight of the steering and how many turns of the wheel you need to get from lock to lock, depending on your speed. It sounds good in theory, costs a reasonable amount and helps you get around tighter turns more easily. However, it also removes any sense of connection with the front wheels and robs you of confidence in the front end. Keener drivers are far better sticking with the standard system, which is more accurate and has a more natural weight. With standard steering, you’ll find it remarkably easy to place the front of the car on entry to a corner, despite there being quite a bit of weight over the nose. And with quattro (Audi’s four-wheel drive system) fitted as standard, traction out of the corners is equally mesmerising. Unfortunately, there’s none of the adjustability offered by the rear-wheel-drive Giulia Quadrifoglio, BMW M4 and Mercedes-AMG C63, but that feels acceptable in a car that’s designed to get you, your family and your ski gear to St Moritz as fast as is humanly possible. And if you decide to visit the slopes of the Black Forest instead, you can be safe in the knowledge that the RS4 packs more than enough punch for the German Autobahn. 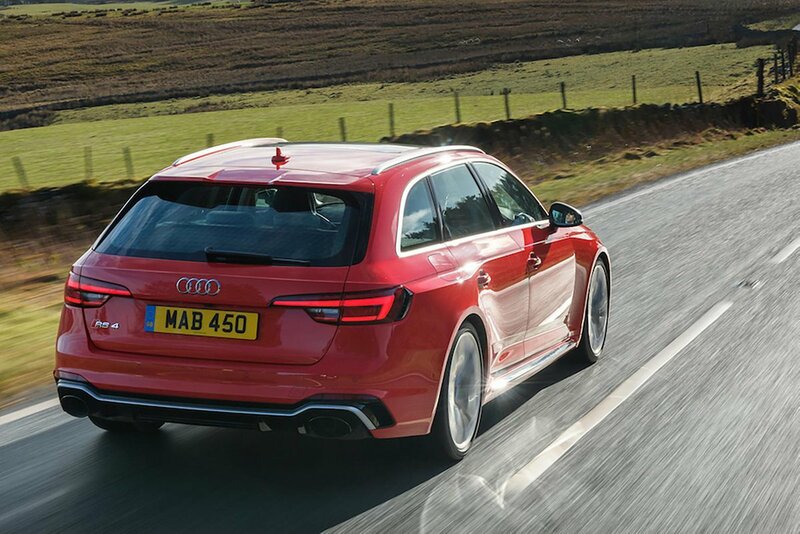 With 444bhp, the RS4 can get from 0-62mph in just 4.1sec and onto an electronically limited top speed of 155mph (this can be increased to 174mph as an option). This performance comes courtesy of a new turbocharged V6; an engine shared with the Porsche Panamera 4S. In normal use, it’s a smooth and refined unit that fades into the background, while in Dynamic mode it howls and parps as you want it to. However, a turbocharged V6 will never be able to compete with the monstrous V8 from the C63 – an engine that sounds wonderfully raucous at full throttle.